Fellowship Road of Fort Worth, Texas, has willingly, gladly sung whenever and wherever God has provided opportunity. The songs have been offered as praises and thanksgiving to the Lord for all that He has given to all. To share what our Father has given, we also sing to everyone within earshot who will hear the good news. Richard Dickerson, lead singer, grew up with quartet music, as did Bob Schmidt, baritone. They began their ministry on 2000 and ministered as a duet for 6 years. Missing from the group was a tenor. 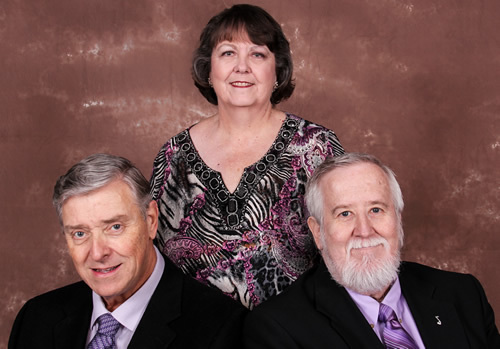 After praying for a tenor to join the group, they found a gift from God, Richard's wife Linda, the trio's alto. Also, their family members and friends are very much a part of Fellowship Road by providing prayer, physical support, and encouragement. They continue to ask God for a pianist and hope that God will answer that prayer with another gift sometime soon. Fellowship Road considers itself a ministry for the good news of Jesus Christ and desires to live, teach, share, and sing in such a manner that no one will mistake them for anyone but Christ followers. They are entrusted with God's blessings in their lives. They love God, faithfully and obediently, with every ounce of strength and breath, and minister, lovingly and sincerely, to others based on God's own perfect, holy example â Jesus, our Lord and Savior. Their new project Stepping Into The Water will be released soon with such songs as He Touched Me, He Left It All, and It Pays To Pray.